Welcome to our website. Our objective is to keep Class Association members informed of all matters relating to the Lymington River Scow dinghy and provide a focal point for information. This site is subject to continuous improvement and subject to change. 25th September- AGM and Annual Dinner 2015 at the Royal Lymington Yacht Club. AGM starts at 18.30 followed by dinner. 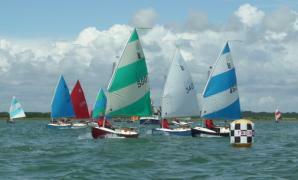 2nd & 3rd July 2016 - A weekend date for your next year's diary: our LRSCA National Championships will be held at Keyhaven, hosted again by KYC. The 2015 LR Scow Nationals hosted by RLymYC took place on 20th/21st June in challenging conditions. For full report click here and for results click here. The LR Scow is an easy boat to tow. 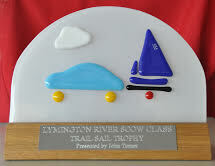 To encourage members to participate in Association events even when these are held away from their home club, for example this year's rally in Chichester Harbour or the Nationals, and so to sail with members in different locations, John Turner has presented this new trophy. It will be awarded annually to the member who has towed their LR Scow the furthest distance to an event. This unique and beautiful but lighthearted trophy (shown below) has been crafted in glass on an oak base by Jane Pitt-Pitts. A day's sailing took place on Wednesday 15th July 2015 in Chichester Harbour with Association members from Lymington/Keyhaven joined with local scow sailors in a ‘potter’ with a picnic lunch and supper to finish. In total, about 47 LR Scows participated in this epic sailing event. Read about it here. 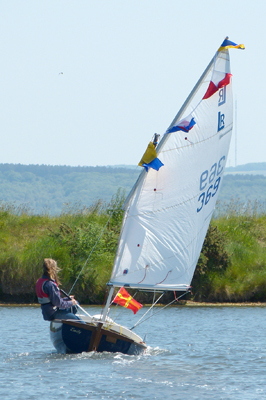 Scows racing in the 2014 National Championship off Keyhaven. For report click here. On Saturday, 8th June 2014, most of the committee descended on Salterns Sailing Club to present Emily, LR 369, to them on behalf of the Association. Read full report here. For latest report click here. John has modified his website to include a news section. To try it out follow this link: http://www.news.johnclaridgeboats.co.uk. This is how it appears on a sweatshirt. There is a certain amount of flexibility in the design, in that one can specify a) the hull colour and b) the sail colours. The name of the boat and the sail number can be added to further personalise it. The design can be applied to sweatshirts, polo shirts, etc. and scaled accordingly. We will have samples on display at the coming Nationals and at the AGM. In order that we can keep track of all the Lymington River Scows we ask that all owners selling or transferring ownership of their boats, notify the change and return the Ownership and Buoyancy Certificate to the Hon. Secretary. This will ensure that new Owner's Certificates are issued to the new owners and keeps our register of boats up to date. Acknowledgements to Pickaweb Internet Services for hosting this website.